Miss Vickie's Kettle Cooked Potato Chips. Miss Vickie's Chips are kettle cooked, in batches, and seasoned to perfection. 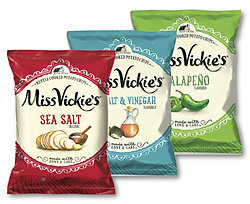 We have 4 great flavors, Jalapeno, Salt & Vinegar, Farmhouse White Cheddar and Original Sea Salt. Each bag is 1.75 oz. Choose your favorite flavors below.